Garabandal, Padre Pio and the Servant of God ! Conchita received a telegram from Lourdes on October 15, 1968. She was urged to be there on October 17. Providentially, Father Alfred Combe of France just arrived in Garabandal with Bernard L’Huillier. Conchita asked him if he would drive her and her mother,Aniceta, to Lourdes. Father Combe agreed and here is his account of what transpired once they got there. On October 17, 1968, we arrived at the Hotel Cluny, Lourdes. This was the rendez-vous stated in the telegram to Conchita. We arrived there about 1:00 p.m. Several Capuchin Fathers and Mr. Bevelacqua from Naples, Italy, welcomed us with joy. But first we wanted to get settled and one of the Capuchins promptly took care of it. Our hosts and a group of important pilgrims from Naples were lodging at this hotel. A Miss Luigina of Rome had come to Lourdes with the pilgrimage. She carried a personal message that Padre Pio of San Giovanni had written for Conchita before his death. But no sooner had she arrived at Lourdes when she had to be hospitalized, gravely ill. A telegram had been sent to Garabandal requesting Conchita to come immediately to Lourdes. I confirmed what Conchita had told me during the trip. Miss Luigina was a friend of Conchita’s who had received her into her home during Conchita’s famous visit to Rome at the beginning of 1966. Very kindly our hosts asked us to dine with them before going to the hospital, and we accepted. But this was not a simple matter. The news of the arrival of Conchita and her mother was passed from mouth to ear with the speed of light and despite all the orders of absolute secrecy that I had given to all; we had to introduce Conchita and her mother in a room at the restaurant. A double row of people, in profound silence and admiration, hemmed us in. Afterwards, Conchita confided to me that she had been embarrassed to death. After dinner our Italian friends hurried to lead us to the hospital. Conchita prudently suggested that she not be left alone but that some one stay with her at all times. I promised to be a vigilant observer. Then we proceeded to the hospital. Two Capuchin Fathers and a religious let us to the sick room. They entered first followed by Conchita and her mother and then me. My friend Bernard, decided to stay with the others on the landing in the passageway. These are the places we occupied in the hospital room. Conchita on the patient’s left, Aniceta, Conchita’s mother, at the foot of the bed a little toward the side, and I myself at the foot of the bed. Behind us were the Capuchin Fathers and the religious. From my point of observation, which was excellent, this is what I saw and heard. Luigina, the Patient, although in a great deal of pain (an enormous ballooning of the stomach whick made me think of peritonitis), showed great joy upon seeing Conchita. She embraced her affectionately. There followed an exchange of greetings and a few words about the state of her health. But it was brief. Luigina (Gina) explained that through Professor (Enrico) Medi at San Giovanni, she had been given a message for Conchita from Padre Pio. This message, full of peace and comfort, had been dictated to Father Pellegrino by Padre Pio at San Giovanni Rotondo before his death. She directed the religious to look in her purse and from the bag I saw her take out two envelopes. On the first was written « Through Father Pellegrino to Professor Medi », on the second envelope it said « To be sent to Conchita Through Gina ». From the second envelope she took out a sheet on which was handwritten a short message of five or six lines that she handed publicly to Conchita who held in her hands for a moment. Not understanding Italian, the language in which this message was written, it was impossible to certifiy exactly the contents of those few lines. That which I did understand without question is that Padre Pio assured Conchita of his prayers and the offering of his suffering and he sent her his most paternal blessing. After a moment, I saw a Capuchin priest approach Gina. She gave him a sheet of paper. He went to the window, carrying the sheet by the corner. I saw him photograph the text of the message. Evidently it would be relatively easy for the Sacred Congregation to have the exact of the message through Father Pellegrino of San Giovanni Rotondo. I couldn’t help but notice Conchita’s joy and emotion upon receiving the message from Padre Pio. As for Aniceta, like myself, she had missed nothing. She observed carefully the whole time. To authenticate her mission, Luigina asked the religious to locate another, bigger briefcase. She took from this several « relics » of Padre Pio : The corporal from his last Mass, a handkerchief which was used to dry his eyes, a dressing from his wounds and the Veil (a piece of netting about 20 X 27 inches) which covered the face of Padre Pio after his death. This last one the ill woman gave to Conchita to guard as a precious memento. She accepted it with piety and veneration. Then Luigina asked that she be allowed to speak to Conchita alone for a few minutes. We were then brought back into the room and said our good-byes. The ill woman appeared perfectly rational to me with complete confidence in the protection of the Blessed Virgin Mary. She assured Conchita of her prayers and the offering of her cross. It was already 3.40 p.m. We had to let our dear Italian friends know that we were pressed for time. In fact, Conchita and Aniceta wanted to take part in the Procession of the Blessed Sacrement on the basilica esplanade which started at 4.30 p.m. We had just enough time for Mass. Garabandal Journal (July/September 1997) Page 12 and 13. In this new testimony, we are learning that Father Combe accompanied Conchita in Lourdes in October 1968 as Conchita received an important telegram and was urged to be there on October 17, just few days after the « death » of Padre Pio (Sept 23, 1968), indeed, a certain Miss Luigina of Rome had come to Lourdes and carried a personnal message that Padre Pio had written for Conchita but not sooner had Miss Luigina arrived in Lourdes when she had to be hospitalized, gravely ill, which explains why Conchita was urged to be there as soon as possible, surely Miss Luigina wanted herself to give this message from Padre Pio to Conchita directly but falling seriously ill, her relatives decided to send an urgent telegram to Conchita, in case, as we never know, if Luigina were to die, explaining probably the urgency telegram. Miss Luigina and Conchita knew each other as Luigina had received her into her home during Conchita’s famous visit to Rome in 1966 when she was called by the Sacred Congregation headed at that time by Cardinal Ottaviani for an interview, it’s also during this trip that Conchita met Padre Pio and Pope Paul VI according to the seer herself. 2. When she met Conchita, Miss Luigina was in hospital because she fell seriously ill, Father Combe himself participated at their meeting, his testimony tells exactly point by point this meeting as from his point of observation, which was excellent according to him, this was what he saw and heard in the patient’s room, 2 Capuchin Fathers and a Religious were also present as Aniceta, Conchita’s mother, so 6 Persons in total + Luigina, it would be infounded to question the testimony of this Great Priest, even if Father Combe was himself a promoter of Garabandal, why the Priest would have to lie, this has never been the way to do even from a Promoter of Garabandal, let alone a devoted Priest as was Father Combe all his life, the details of this meeting are also very accurate. 3. Luigina explained that through Professor Enrico Medi at San Giovanni, she had been given a message for Conchita from Padre Pio. For our information, we must remember that Professor Medi was also known to be very close to Padre Pio and considered as one of his spiritual sons, Professor Enrico Medi had been elected to Parliament and a prosperous and successful career in politics lay ahead for him. However, in the political world, Medi felt that it was impossible to always tell the truth. Occasionally, one had to tell a lie. He expressed his opinion but Padre Pio saw no room for compromise and strongly disagreed with Enrico. “Well then, if it is wrong to tell even small lies, I must resign from my position as a member of Parliament,” Professor Medi said. Padre Pio was very happy about his decision, so they were very close each other for years. This message in question had been dictated to Father Pellegrino by Padre Pio at San Giovanni Rotondo before his death according to Father Combe, Father Pellegrino was one who personnaly watched over Padre Pio, he was also in Padre Pio’s room during the night in which he « died » so as Professor Medi, Father Pellegrino was very close to the futur Saint. 4. According to Father Combe, there were 2 envelopes, on the 1st was written « through Father Pellegrino to Professor Medi » and inside a 2nd envelope « to be sent to Conchita through Gina » (Luigina short name), from this second envelope Luigina took out a sheet on which was handwritten a message in italian of 5 or 6 lines that she handed publicly to Conchita, this message has been photographed by one of the Capuchin Priest who was present as well. 5. This photograped message (attached) is our 1st evidence and as Father Combe said, it would be relatively easy for the Sacred Congregation to have the exact text of the message. 6.The message (already known by Garabandalists) is dated August 22, 1968, 1 month before the death of Padre Pio on Sept 23, 1968, Pope Pius XII instituted the feast of the Immaculate Heart of Mary in 1944 to be celebrated on 22 August coinciding with the traditional octave day of the Assumption. I pray the most Blessed Virgin to comfort her and to guide her towards sanctity, I Bless her with all my Heart. These 4 relics of Padre Pio given to Conchita by Luigina are our 3rd evidence because we do not give that kind of relics to anyone, knowing that at the time, Padre Pio was already regarded by many as a Saint. The Priest can not invent the name of each relics since the details are very precise, it is also relics of a futur Saint, no one can believe that a Priest could invent such details so precise as the relics does not belong to anyone but to a futur Saint, let alone for those who knew Father Combe, a lie or whatever here are impossible. 10. But why this confidence to the Virgin Mary and who is this Miss Luigina ? that was my question and the main goal of my investigation. Who is Miss Luigina ? According to my information, Miss Luigina was only Luigina Sinapi, an Italian Mystic, declared Servant of God by the Congregation for the Causes of Saints on March 26, 2004, known also to have had an intense friendship and spiritual with Pope Pius XII and Padre Pio, as we know Servant of God is the title given to a deceased person of the Catholic Church whose life and works are being investigated in consideration for official recognition by the Pope and the Catholic Church as a saint in Heaven, Receiving the title Servant of God is the first of the four steps in the Canonization Process, her life in brief below. Luigina Sinapi was born September 8, 1916 at Itri (Latina), Italy. She was the eldest of five children of Francis Paul Sinapi, a cabinet maker, and Filomena Catena, a licensed midwife. She was born together with a twin girl, who tragically died the same day. Her parents feared they might lose Luigina also, and therefore her birth was registered only two days later. She was baptized with the name of Luigia, but her family and friends always called her Luigina or simply just Gina. “Beginning in her early childhood, Luigina felt a strong love for Jesus that manifested itself in a desire to live in intimate union with Him, to which she felt herself particularly attracted” writes Cardinal Vallini. Her mother was a pious Catholic, and on one occasion she went to San Giovanni Rotondo to recommend her husband and her daughter to Padre Pio. The good Padre said to her mother: “You have one child in Heaven [referring to Luigina’s twin sister who died at childbirth] and the Lord has great designs on the other who is here on earth”. This was confirmed by Fr. Tarcisio, OFM. Cap. (Zurlo) from Cervinara, the sacristan who was the assistant to Padre Pio. She was “lively and impulsive”, remembered one of her younger brothers, as she had the habit of reading to them a passage from the Gospel while their mother was out working, “she would even comment on it”, her brother stated. Concerning herself she said with a slight smile “I was always a terrible child.”, but others who knew her all recall her being a very good girl. At 16 years old, Luigina was fascinated by the ideal of the Daughter of St Paul ‘to spread the Gospel by the most modern means of communications’, so overcoming the resistance of her parents she entered the institute the Pious Society of the Daughters of St. Paul in Rome. Unfortunately she was obliged to leave the institute because of her delicate health. She was comforted by her spiritual director, Blessed Father Guiseppe Timoteo Giaccardo, who exhorted her to offer her life for souls, and to remain in the Pauline family as a laywoman. Some particularly extraordinary events marked her life. When she was 17 her mother died suddenly, and she took over the care of her younger brothers. It was not long after that she began experiencing extreme pain in her stomach and she was soon diagnosed with a tumour on the bottom part of the right intestine. The physician could not operate as he believed she would not survive the operation. As the days passed she grew more and more ill and her pain and suffering became more and more acute. Luigina then realized that the beautiful woman was the Blessed Virgin Mary. Jesus asked her: “We have come to make you a proposal. You are free to choose. Do you want to die and to ascend into paradise, or would you be willing to offer yourself as a victim for the Church and for Priests? “. Jesus tells her that she is not to become a nun, but to remain as a lay person in the world. He tells her that she will often be misunderstood, and that she will suffer much, and that she will die alone. He told her she is to be like a violet, hidden but always perfumed. Jesus then presented His Mother to her, to be her special advocate, guide and comfort. “From this point on, the Madonna entered into the life of Luigina by special right”, commented Fr. Tarcisio. When Jesus finished speaking, her guardian Angel Samuel took her by the hand, and suddenly she found herself completely healed. 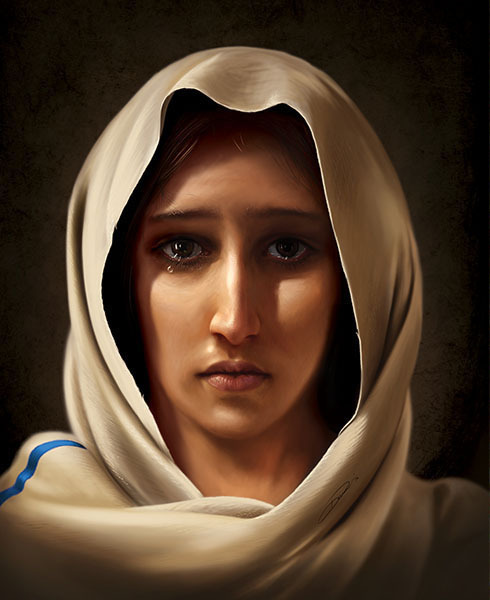 After her miraculous cure, the Blessed Virgin Mary would appear to her on First Saturdays and other special Feast days of the Church. From that day, she was always faithful to the simple program which she had clearly felt inside herself: to be a simple lay person living her intense spiritual life mostly hidden from the eyes of the world; to suffer much, and be “a little mustard seed in a furrow in Rome”. In 1934 the family home was lost and the family dismembered, her little brothers were taken by relatives or sent to boarding school while Luigina went to Rome to live with an aunt, working at home, then at the Post Office, and then in the Bureau of Statistics. While she was walking in a grotto near a grove of eucalyptus trees, Luigina saw something that deeply aroused her piety: she found some small bones that would seem human, and she realized they were likely the gruesome remains of an abortion. Saying a prayer or mercy and forgiveness she dug a little and buried a Miraculous medal together with the little bones. “I will return to this place of sin and I will convert and make use of a man who combats the Church, and who will desire to kill the Pope. Go to St. Peter’s Square and there you will find a lady dressed in black, who will take you to her brother who is a cardinal. To him you will transmit what I have just told you, and you are to tell him also that soon he will become Pope”. Luigina did as told; she went to St Peters square and came upon the woman dressed in black—it was the Marquise Pacelli, who introduced her to Cardinal Eugenio Pacelli. Luigina confided to him the message that she had for him, who answered only: “If they are roses they will bloom “. Two years later he was elected Pope with the name of Pius XII. In 1947, exactly ten years later and in the same place which The Virgin appeared to Luigina – where there is now the Sanctuary of “Blessed Mary of the Third Millennium at the Tre fontane” – the Virgin had then appeared to a certain Bruno Cornacchiola with his children to tell him: “Enough! Re-enter into the true sheepfold of Christ… my Body could not decay and it did not decay … “. Bruno was a protestant tram driver, a former soldier in Spain, and deeply hostile to the Catholic Church. It was just in the days prior to the Blessed Virgin Mary appearing to him that he had decided to assassinate the Pope. But now he began a most extraordinary conversion which shocked and stunned many in the Catholic church in Rome. For his part, Pope Pius XII didn’t hesitate at all and immediately believed in the apparition of the Blessed Virgin Mary to Bruno Cornacchiola at Tre Fontane since he was already aware of it for years through the message of Luigina Sinapi. Six months later, October 5, 1947, in St. Peter’s Square, Pope Pius XII blessed the statue of the ‘Virgin of Revelation” of actual human height, brought to Tre Fontane in solemn procession. Bruno Cornacchiola himself was received subsequently in audience by the Pontiff so that he could consign to him the dagger with which he intended to kill him. When the Pope was asked about all this, Fr. Gabrio Lombardi stated that the Pope had simply replied: “I already knew”. In 1950, Luigina was given the grace to see Padre Pio. She had been making visits to the Four Major Basilicas in Rome when she repeatedly saw in front of herself a Franciscan Capuchin, but always from the back. She sensed however that there was something special about him. At the end of the pilgrimage this Capuchin appeared again and suddenly he turned towards her and it was Padre Pio; but in: bilocation! The strong spiritual bonds between Padre Pio and Luigina have come to be known from the testimony of Fr. Tarcisio in a written statement he gave on April 17, 1982. Once Luigina felt the need to ask counsel of the holy Capuchin regarding the appearances of the Madonna to her; he attentively listened to Luigina and then he encouraged her: “When the Madonna comes, kiss her feet for me”. In 1953, Luigina was unjustly accused theft at the shop where she was employed and she lost her job and lodging. Under accusation, abandoned by everyone, and not knowing what to do she went to San Giovanni Rotondo to see Padre Pio. Fr. Tarcisio perfectly remembers this occasion, that when he saw before himself this woman who he never saw before, he wondered to himself how it was that she was greeted as “an old friend” of Padre Pio, not realizing at that time the spiritual and mystical bond between the two. He (Padre Pio) gave her a banknote of five lire and also he gave her a closed envelope for a police officer friend who lived in her town: it contained the name of the guilty party. While afterwards she was recognized as being completely innocent, for Luigina it was a period of great sadness and mortifications. For about twenty-five years she had to live on other people’s hospitality, in exchange for her company and her domestic help, and through this she had to bear a number of bitter crosses. A friend that welcomed her in Statute Street, Maddalena Tizian, was witness to some of Luigina supernatural manifestations, to which she personally didn’t want to easily accept as being authentic: “I was really the first one to fight her, to not want to believe her, and this made her suffer greatly”, she said. And she once said to Luigina that for many people she (Luigina) “was a question mark”. A religious sister that served as her nurse, Sister Gerardina Sanita, remembered that Luigina, ” … asked permission for everything from her spiritual director, who she used to teasingly call “Bear”, because he was always seemingly severe with her”. Truly because she distrusted herself, she continually sought the advice and the guidance of the priest, to whom she always placed herself entirely. Many can testify that, whatever person came to her, Luigina always sent them first to her spiritual director or the priests whom she knew, and whatever decision she would make, she always passed it through their counsel in obedience to them. In the later years of her life, Luigina Sinapi was given the great privilege of having Jesus in the Most Holy Eucharist present in the small Chapel inside her home on Urbino Street, where it was possible to celebrate daily and Sunday Mass. Her modest home became thus always more, the “center of fervid spirituality up until her death”, as afterwards stated Fr. Cammarota. The authorization to have the Blessed Sacrament in her home – which was always renewed by the Vicariate of Rome—was due to Monsignor Pietro Bianchi, who had a deep respect and admiration for the piety and devotion of Luigina. In 1970, after having lost her secretary job, Luigina continued her true work with even more fervor—she called it an “apostolate of consolation”. People came to her and she deeply interested herself in other people’s problems, giving and helping in every way she could, without ever asking anything in return. She had little, but her home was always open to all, without time limits she kept company with those who were suffering, and listed to their heartaches, and gave encouragement, and offering advice when necessary. Her holy death Concerning Luigina, Cardinal Vallini states (in part): “In her autobiographical slogan ‘A mustard seed in a furrow in Rome’, we see a clear image of the style of the life of the Servant of God: to suffer and to offer her life, in union with the sacrifice of Christ. In the spirit of the Gospel, she wanted to consider herself a small mustard seed left to fall in a furrow for the Church. Luigina, a daughter of the Church, was in service to the Church in so many ways and circumstances, with prayer, counsel, discernment, teaching, material and spiritual help, offering herself as a victim. Truly her spirituality can be synthesized in the expression “to suffer and to offer”. Luigina Sinapi died a holy death at Rome, April 17, 1978, a voluntary victim of the merciful love of Jesus and the Virgin Mary, in a holocaust for the Church and the world”. Her attending medical doctor, Dr. Mark Grassi testified that the last days were of great suffering for Luigina. Yet she was very peaceful, loving and happy. On one occasion, smiling she was overheard murmuring, “I am waiting!” At the moment she died she was completely alone, just as Jesus had foretold her many years earlier. She was found with her face toward the tabernacle. The funeral was celebrated in the Basilica of the Holy Cross of Jerusalem in Rome, and she is buried in the cemetery Verano in Rome. Servant of God Luigina Sinapi, pray for us! 7. In 1934 the family home was lost and the family dismembered, her little brothers were taken by relatives or sent to boarding school while Luigina went to Rome to live with an aunt, working at home, then at the Post Office, and then in the Bureau of Statistics . 9. For his part, Pope Pius XII didn’t hesitate at all and immediately believed in the apparition of the Blessed Virgin Mary to Bruno Cornacchiola at Tre Fontane since he was already aware of it for years through the message of Luigina Sinapi. Six months later, October 5, 1947, in St. Peter’s Square, Pope Pius XII blessed the statue of the ‘Virgin of Revelation” of actual human height, brought to Tre Fontane in solemn procession. 10. Padre Pio appears to Luigina in Bilocation In 1950, Luigina was given the grace to see Padre Pio. She had been making visits to the Four Major Basilicas in Rome when she repeatedly saw in front of herself a Franciscan Capuchin, but always from the back. She sensed however that there was something special about him. At the end of the pilgrimage this Capuchin appeared again and suddenly he turned towards her and it was Padre Pio; but in: bilocation! 11. The strong spiritual bonds between Padre Pio and Luigina have come to be known from the testimony of Fr. Tarcisio in a written statement he gave on April 17, 1982. Once Luigina felt the need to ask counsel of the holy Capuchin regarding the appearances of the Madonna to her; he attentively listened to Luigina and then he encouraged her: “When the Madonna comes, kiss her feet for me”. 12. In 1953, Luigina was unjustly accused theft at the shop where she was employed and she lost her job and lodging. Under accusation, abandoned by everyone, and not knowing what to do she went to San Giovanni Rotondo to see Padre Pio. Fr. Tarcisio perfectly remembers this occasion, that when he saw before himself this woman who he never saw before, he wondered to himself how it was that she was greeted as “an old friend” of Padre Pio, not realizing at that time the spiritual and mystical bond between the two. He (Padre Pio) gave her a banknote of five lire and also he gave her a closed envelope for a police officer friend who lived in her town: it contained the name of the guilty party. While afterwards she was recognized as being completely innocent, for Luigina it was a period of great sadness and mortifications. 13. Her holy death : Concerning Luigina, Cardinal Vallini states (in part): “In her autobiographical slogan ‘A mustard seed in a furrow in Rome’, we see a clear image of the style of the life of the Servant of God: to suffer and to offer her life, in union with the sacrifice of Christ. In the spirit of the Gospel, she wanted to consider herself a small mustard seed left to fall in a furrow for the Church. Luigina, a daughter of the Church, was in service to the Church in so many ways and circumstances, with prayer, counsel, discernment, teaching, material and spiritual help, offering herself as a victim. Truly her spirituality can be synthesized in the expression “to suffer and to offer”. Luigina Sinapi died a holy death at Rome, April 17, 1978, a voluntary victim of the merciful love of Jesus and the Virgin Mary, in a holocaust for the Church and the world”. Her attending medical doctor, Dr. Mark Grassi testified that the last days were of great suffering for Luigina. Yet she was very peaceful, loving and happy. On one occasion, smiling she was overheard murmuring, “I am waiting!” At the moment she died she was completely alone, just as Jesus had foretold her many years earlier. She was found with her face toward the tabernacle. The funeral was celebrated in the Basilica of the Holy Cross of Jerusalem in Rome, and she is buried in the cemetery Verano in Rome (attached picture). 15. Attached a document confirming also her name as the person sent to Lourdes with a message from Padre Pio for Conchita, this is our 6th and last evidence. Conclusion : So it was therefore Luigina Sinapi (attached the picture of her grave), a futur Servant of God, considered by many as one of the main spiritual daughter of Saint Pio and close to Pope Pius XII which via Professor Medi, was chosen by the futur Saint himself to hand deliver a personnal message with few relics (nothing else) to the main seer of an unapproved Marian Apparition. A several-months investigation to finally know who was Miss Luigina, sent to Lourdes in October 1968 by Providence and having with her a written message from one of the greatest Saint of the Catholic Church of the last century, this investigation will of course never replace the Church’s authority regarding Garabandal but no one of good will, will be able to question the Relationship between Saint Pio and Garabandal anymore, I said no one of good will only, thank you. I dedicate this article to Father Combe. Servant of God, Luigina Sinapi, Pray for us. My Comment : I wrote this article 2 years ago, I thought it was time to put it back on the home page, the undeniable proof that Saint Pio believed in our lady of Mount Carmel, enjoy ! Re the time of the Warning. Priests can still say Mass without going into hiding. One of the Garabandal girls said the Warning will happen when the persecution is at it’s greatest, and Priests will have to say Mass in hiding. S0 2018 cannot be the time of the Warning. I read about what a Blessed Soul said. It went like this. When the Red Flag will be raised atop of St Peter’ s ( the Pope being held and kicked (martyred), Our Lady draws near to the Pope and says, Fear Not, Immediately after this the evil men drop (dead) and the Red Flag falls. Maybe, when the two stars in 2022 merge, causing a lot of light, that we here on Earth will see, then this could be the time of the Warning. Conchita mentions like two starts colliding causing a lot of light. One of the seers said Russia will invade Europe suddenly and unexpectedly. The River Rhine will be full of Corpses. When all seems peaceful, invasion will happen. Watch Russia. In the end though Russian people will glorify God the most. I would love to ask what Conchita and the other Visionaries think of this portrait. God Bless Everyone! Forget It. The Cardinal Is Now Part of the Problem. A recent interview of Cardinal Raymond Burke by Catholic World Report’s Chris Altieri should answer the question when the Cardinal will issue the promised “formal correction” of the errors of Amoris Laetitia (AL), as to which he and three of his fellow Princes of the Church (two of them now deceased) issued their five dubia to Pope Francis more than year ago. Apparently there is to be a conference in Rome in April to discuss, among other things, the limits of papal infallibility. May Cardinal Caffarra intercede for us. remember, what did the Blessed Mother our Lady from Mount Carmel say in Fatima. Russia will be the tribulation! I have found a very interesting report, I`m going to give you the link. This report is written in German. To focus on, Russia is going to upgrade its battleships with very modern weapons. The main events of Garabandal will occur 2018?! For me personally, it is probably! 2018 or 2019, I will be wrong only if Nothing related to Garabandal happened before 2020. Thank you for everything you do! I have learned a lot on your website. I do have one question and I apologize if you have already answered it somewhere else. In your opinion, will World War III happen before, during, or after the Warning? Thank you in advance for your response. Most are incompetent and they should not be considered as Garabandalist in no way, thank you. I’d also like to add that “Liberal Garabandal devotees.” Do not understand how anti-human leftist ideology is and about the rapid pace of growing leftism is moving humanity closer to communism. The leftist always asks, what’s so bad about communism and what does it have to do with religion? 1) Communism despises ANY religion period. Communism, particularly loathes Christianity above all forms of religion, because there is inherent belief (or respect) for private property found within the gospels. Private property is a natural right inherently god given quality. 2) The Gospels also attack man’s need to place material world sometimes above spirituality or God as the main goal or purpose for humanity. 3) Communism wrongly misunderstands human nature and tries to be GOD. How so: Human beings are unique; every human is born differently with a different purposes and different tastes with different desires. Communism’s ultimate goal is to erase or eradicate differences in humans and it believes it will create A NEW MAN through FORCED EQUALITY. This belief itself is anti-god and anti-human. 4) Communism pits Man vs Man, woman vs man, black vs white, etc. In that it tries to create envy between the rich and poor…between man and woman…between black and white. Communism and particularly cultural Marxism’s aim is to pit oppressor vs oppressed class into some sort of revolution between classes or races or religion. It is through this pitting of man vs man that communism hopes to divide and conquer and thus step-in fill-in the vacuum. Even now the Homosexual is a tool used by the communists to try to pit straight vs homosexual. In fact the homosexual is the new tool being used to try to subvert the culture. These tool of DIVISIVENESS is Anti-Christian. 5) In order to be Communist one must not believe in a God. Most Communist are atheists, this IS guaranteed. WHY? Because if you primarily see the world through the material lens…between the haves and have nots; then most probably you see an unjust world, and BLAME God or cannot believe a GOD would create such disparity. These are some of the reasons why COMMUNISM IS ANTI-CHRISTIAN and we must fight against. The tools and aims of communism and its not so innocent cousin “LEFTIST ideology” try to use force ON humanity for change. But this force only brings about DEATH, DESTRUCTION and DESPAIR. This is a wake up call. Don’t get me wrong. The right also has “Leftist” tendencies to be wary of, but not as bad. Both sides of the spectrum try to prod humanity into an ungodly world. The European Union is clear example of socialism in that it wants ALL EUROPE to move in one direction and if it does not…it uses monetary punishment on nations that do not fall in line. I have a BIG PROBLEM with people like Bergolio who has sympathies towards people that teach Liberation Theology. (Communism-Christianity) I ask myself how could Bergolio be so ignorant of Communism and its founding anti-human principals? How could he be so blind to the death it has brought to humanity? Can he be this ignorant? AS you can see this is why our Lady is warning us about Communism. This is the greatest threat to man’s existence. Great Comment Mike, Bergoglio cannot be Pope, I said it 1000 times online, this man is not Catholic but communist and a non Catholic cannot be Pope, if the All Church accept him as Pope then the all Church is on the road to Perdition, the Fatima 3rd Secret vision is quite clear, the Bishop in white is killed and Rome destroyed as simple as that. russia president election 18-03-18 any links with Garabandal? Man, Luigina was everywhere! I had no idea it was through her that Conchita received the relics. I lived in Rome and Montefalco and was able to learn of her from the Monastery in Montefalco that she would stay in quite often. Hi my old friend. Can you tell us more about Bruno. I understand he had further prophesy, but I cannot find it in English. Can you help? Hi Mac, my good and old friend, long time, I was missing you, as you know please kiss from me the 8 kids and one by one, please send my Respect to Madame as well. I never heard of Gina. Very interesting. Thank you. Welcome Dennis, the link between Fontana and Garabandal are to me very important especially for the Great Miracle. Pingback: Garabandal, Padre Pio and the Servant of God Luigina Sinapi, Mystic (1916-1978) | WHAT IS GARABANDAL?